Preparing to add 60 seconds of oxygen to LaLa wort, post boil. Requests for a new home brew don’t happen often. Heck, even my wife only requests for the same two beers over and over: Honey Pot Pale Ale and Grass Cutter. Maybe that should tell me something about how my home brews are perceived and/or my home brewing abilities. Nonetheless, a request did come in the shape of my cousin Ron while chatting at this summers’ family reunion. He heard me say “La”. He asked me to say it again, mentioning that it had been a long time since he had heard someone call his Mother “La”. Of course she is my aunt and my Dad’s twin sister. Her real name is Catheline. “La” came about when my Dad was little and did not have the ability to say Catheline. Instead, he could say “La La”. Somehow it stuck. Ever since I am able to remember, we referred to Ron’s mom as Aunt La. I not going to bore with more family details but let’s just say Aunt La, a damn hip and cool lady, has had a large helping of misfortune in her life. Ronny asked if I could make a beer for the 2nd annual New Year’s day get together, at my house, to honor his Mom. Of course I couldn’t say no, nor did I want to. Now I had to determine the beer style and recipe that is fitting of Aunt La. A strong beer with the potential for multiple ways (bourbon soaked oak chips, large dry hop and possibly some with a combination of both) of changing the final product seemed to be the best route to go. In order to brew up a large beer I had to get one more piece of brewing equipment that I have wanted for a long time and has held me back from brewing high gravity beers: pure oxygen. 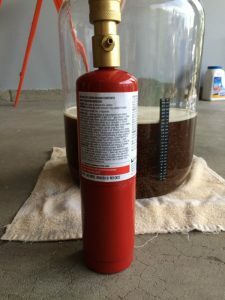 It has been at least a couple of years since I brewed a high gravity beer for the simple reason of my hyper-sensitivity to alcohol flavors in beer. The process of shaking the carboy only has lead me to believe that mine have that off-flavor. I was waiting for a time that I could get the necessary equipment and the wife wouldn’t bat an eye. Paying homage to my Aunt was an easy win. Researching award winning barleywines and professional clone recipes, I ended up with what is below. The hope is there that everyone will taste and enjoy this beer that is truly created to represent Aunt La in liquid form. Enjoy! 2016-09-04: @1600 the temperature was @83.8*F, placed on concrete basement floor. 2016-09-05: @2100, fermentation showing good signs. 2016-09-06: @67.2*F, added heat @69*F.
2016-09-14: Took of heat. Left at ambient basement temperature. This entry was posted on Sunday, September 4th, 2016 at 6:55 am	and is filed under Beer, Beer Recipes, Home Brewing. You can follow any responses to this entry through the RSS 2.0 feed. Both comments and pings are currently closed.